Our research strategy is designed to get new treatments to patients faster by funding across the entire research pathway and ensuring every person diagnosed with brain cancer in Australia has access to a quality clinical trial. Over the last five years, Cure Brain Cancer Foundation has invested more than $18 million in research. More than 90 per cent was invested in Australia. The other 10 per cent is helping to ensure that Australians have early access to world-class treatments as soon as they are available anywhere in the world. All research projects are reviewed by our internationally renowned Scientific Advisory Committee. Click on the below links to learn more about each program. Cure Brain Cancer’s vision is that every person diagnosed with brain cancer in Australia can access new treatments through world-class clinical trials. To date, there have been few therapeutic trials available in Australia for brain cancer patients. The Clinical Trials Stimulus Program is designed to change this and make the most promising Australian-initiated trials - as well as international trials - available to Australian patients at the same time as they are available globally. Bringing clinical trials to Australia provides a multitude of benefits. All patients involved with clinical trials report better health outcomes, including those on the standard treatment arm of the study and even those screened for the trials that are ineligible. Bringing promising trials to Australian sites allows patients to stay closer to home and their support networks, and reduces the financial burden associated with travelling overseas for treatment. “We scour the world for the best clinical trials and work with our international partners to bring them to Australia, so that novel treatments are available at the same time for Australian brain cancer patients as they are globally." A pilot clinical trial to investigate the effectiveness of immunotherapy drug nivolumab, in children with hypermutant tumours, which are tumours with an extremely high number of mutations. BIOMEDE is the first adaptive clinical trial in Australia for DIPG that will analyse a child's brain tumour and identify which of the three drugs approved for the trial is most likely to be effective. Zero Childhood Cancer is a personalised medicine and clinical trial program for children, where researchers and clinicians will conduct detailed laboratory analysis of each child’s unique cancer cells, to help identify the drugs most likely to kill their cancer. A phase 2 clinical trial investigating the effectiveness of adding a new drug to radiotherapy and chemotherapy in patients with newly diagnosed, unmethylated MGMT glioblastoma. A phase 1 clinical trial of a new antibody that targets EphA3, which is a cancer protein that makes GBM aggressive and treatment resistance. GBM AGILE is a revolutionary new clinical trial which presents a brand new way of testing and developing brain cancer treatments; a world-first global adaptive clinical trial brought about by the biggest collaboration in the history of brain cancer research. Discovery Funds supports basic research, which is the foundation of all medical research. A/Prof Wong's team will study changes in gene expression (epigenetics) that can lead to gliomas - the most common form of brain cancer. EGFR is a protein which is mutated in the majority of high-grade gliomas. The team are investigating resistance to EGFR-targetted therapeutics and ways to overcome this. The Cure Brain Cancer Biomarker Discovery Program brings together biomarker research that is being conducted across the country. Biomarkers are increasingly demonstrating value in cancer detection, diagnosis, prognosis, selection of therapy and prediction of treatment response, dosage, identification of disease relapse and recurrence, surrogate endpoints for clinical trials and the development of drug targets. 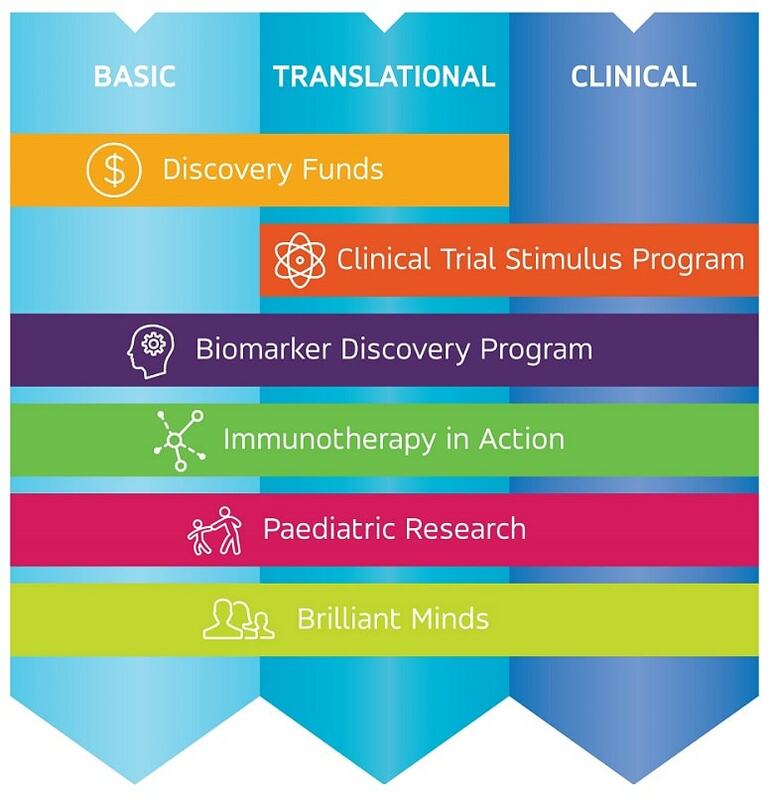 The Biomarker Discovery Program covers the entire pipeline, from basic research to translational, and integration and use of biomarkers in clinical trials. Professor Scott's team will investigate the use of imaging signatures to predict the prognosis of patients with glioblastoma. The team will also determine if these imaging signatures can predict the likelihood of a paitent responding to therapy, or, if they are experiencing any resistance to therapy. This project aims to identify new prognostic markers and investigate drug therapies for specific Oligodendroglioma tumour types based on their molecular signature. Professor Brandon Wainwright's laboratory is currently pursuing studies of primary brain tumours in children and is embarking on the use of “genomic technology” to understand brain tumours that occur in adults such as glioblastoma. The Cure Brain Cancer Neuro-oncology Group is based at the Lowy Cancer Research Centre at UNSW and focuses on precision medicine. It is also part of the Brain Cancer Discovery Collaborative. Developing microRNA detection in blood as a simple, rapid, cheap and accurate biomarker for brain cancer diagnosis and prediction. The team aims to deliver a novel diagnostic strategy for glioma that, in addition to providing a unique solution to treatment planning, will inform the rational design of targeted therapies. This project is part of the Cure Brain Cancer Neuro-oncology Group and will study exceptional responders to a targeted antibody, to identify biomarkers to predict which patients will respond to the drug. Understanding the various cellular pathways that allow tumours to survive and grow will allow us to develop effective strategies for treating patients with brain cancer. This is part of the work of the Brain Cancer Discovery Collaborative. Developing new quantitative biomarkers of early treatment response in high grade glioma, based on an imaging technology called positron emission tomography (PET) using the tracer FDOPA. We will use this technology to better understand and define tumour metabolism. This is part of the work of the Brain Cancer Discovery Collaborative. Understanding invasion by glioblastoma, the most common malignant primary brain cancer in adults, is the first step towards new specific treatments with fewer side effects. This is part of the work of the Brain Cancer Discovery Collaborative. Immunotherapy harnesses the body’s own immune system to fight cancer. It is a growing field in cancer research and has shown some promising results, including in other cancers such a melanoma. Cure Brain Cancer’s Immunotherapy in Action program seeks to grow and support the immunotherapy field in brain cancer from basic research, translational research through to clinical trials. Dr Mazzieri's proposed research investigates strategies to harness the power of immunotherapy to improve glioblastoma treatment. Investigating the mechanisms of resistance to antibody-drug conjugates (ADCs), a group of drugs which have shown highly encouraging efficacy in glioblastoma (GBM). This research is particularly important since it focuses on an ADC that is undergoing accelerated testing for GBM patients. One metabolic pathway which impairs the immune system in brain cancer patients is the kynurenine pathway. The team are investigating novel therapeutics that target this pathway to restore normal immune system function. Based at the Kolling Institute at the Royal North Shore Hospital, this emerging brain cancer immunotherapy clinical trials expertise will give people living with brain cancer access to potential new treatments. Beginning with a 6 month pilot phase. Cure Brain Cancer’s Paediatric Research Program covers all stages of research from basic to translational research and clinical trials in all areas of research, including precision medicine. Paediatric research includes work on paediatric-specific tumour types and research that is applicable to paediatric forms of brain cancer more broadly. A pilot clinical trial to investigate the effectiveness of immunotherapy drug nivolumab, in children with hypermutant tumours, which are tumours with an extremely high number of tumour mutations. BIOMEDE is the first adaptive clinical trial in Australia for DOPG that will analyse a child's tumour and identify which of the three drugs approved for the trial is most likely to be effective. Nick Gottardo's research aims to find approaches that enhance existing treatments, prove the new methods work using laboratory techniques, then translate them into clinical trials. Dr Nick Gottardo's team is identifying new therapies to be tested in clinical trials by using high-throughput robotics to screen thousands of drugs. This is part of the work of the Brain Cancer Discovery Collaborative. Read more about paediatric research within the BCDC here. The team aim to develop novel strategies to efficiently kill medulloblastoma cells without causing intolerable damage to healthy tissues, by utilising recently developed BH3-mimetic drugs that directly activate the cell death pathway. Brilliant Minds is Cure Brain Cancer Foundation’s young researcher support and communications program. It is designed to encourage cross-disciplinary movement into brain cancer research and grow and support brilliant minds early in their careers. We are committed to encouraging Brilliant Minds into brain cancer research and want to attract the best and brightest to work in one of the most challenging areas of research. Australia has a truly collaborative network of brain cancer laboratories and is poised to create significant impact in the area. We will support excellent talent to be a part of this movement. Medulloblastoma is a leading cause of cancer-related mortality and morbidity in children. Few effective therapies are available for patients with high-risk disease or tumours that recur following standard-of-care therapy and thus, these patients have a poor prognosis. Based on this, Dr Genovesi has focused on identifying novel Medulloblastoma targeted therapies for Medulloblastoma. T cells are white blood cells which can recognise and kill tumour target cells. However, tumours often outsmart the T cells so they can't kill them anymore. Dr Cross aims to re-arm these T cells with new genetically engineered weapons to kill highly fatal brain cancers in both children and adults. our monthly newsletter and social media channels. Sign up for email updates and follow us on Twitter and Instagram. Cure Brain Cancer Foundation's Capacity Building Program aims to increase the capacity, validity, and effectiveness of brain cancer research models systems in Australia. These projects will provide support to key research groups that currently develop primary brain cancer model systems and provide these as a resource to other research groups. Model systems are a valuable resource to quality medical research and it is vital that Australian researchers have access to this critical technology to accelerate the number and quality of potential brain cancer agents to clinical trials. This project will aim to identify new drugs to combat glioblastoma, through the development of a unique library of paired primary and recurrent glioblastoma models. Dr Gomez will lead a project that aims to use brain organoids to understand the process of cancer cell invasion and the potential drugs that can stop it.